The most important physical property of a lubricating oil is viscosity. It determines the load carrying ability of the oil as well as how easily it circulates. The correct balance between high viscosity for load carrying and low viscosity for ease of circulation must be considered for any lubricant and its application. Oil provides benefits in addition to lubrication, and it is vital that it be able to flow under all conditions. When in use, contaminants such as water, fuel entering the oil, oxidation, and soot all affect the viscosity. 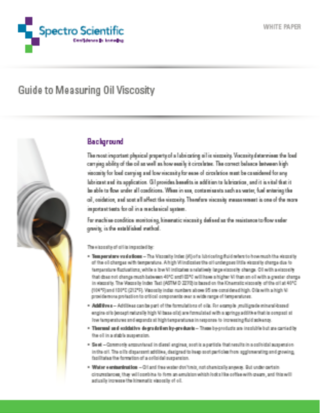 Therefore viscosity measurement is one of the more important tests for oil in a mechanical system. For machine condition monitoring, kinematic viscosity, defined as the resistance to flow under gravity, is the established method. • Temperature variations – The Viscosity Index (VI) of a lubricating fluid refers to how much the viscosity of the oil changes with temperature. A high VI indicates the oil undergoes little viscosity change due to temperature fluctuations, while a low VI indicates a relatively large viscosity change. Oil with a viscosity that does not change much between 40°C and100°C will have a higher VI than an oil with a greater change in viscosity. The Viscosity Index Test (ASTM D 2270) is based on the Kinematic viscosity of the oil at 40°C (104°F) and 100°C (212°F). Viscosity index numbers above 95 are considered high. Oils with a high VI provide more protection to critical components over a wide range of temperatures. • Additives – Additives can be part of the formulations of oils. For example ,multigrade mineral-based engine oils (except naturally high VI base oils) are formulated with a springy additive that is compact at low temperatures and expands at high temperatures in response to increasing fluid solvency. • Thermal and oxidative degradation by-products – These by-products are insoluble but are carried by the oil in a stable suspension. • Soot – Commonly encountered in diesel engines, soot is a particle that results in a colloidal suspension in the oil. The oil’s dispersant additive, designed to keep soot particles from agglomerating and growing, facilitates the formation of a colloidal suspension. • Water contamination – Oil and free water don’t mix, not chemically anyway. But under certain circumstances, they will combine to form an emulsion which looks like coffee with cream, and this will actually increase the kinematic viscosity of oil.